It's a global, high-tech world, and the microscope camera has become a big part of it. A quality camera captures images for demonstration, enhancement, and observation purposes. Whether in the laboratory or at home, the ability to capture what you see with your microscope is a huge and exciting part of modern research. Many companies produce different models of cameras that are affordable for all budgets. They are still more expensive than most everyday digital cameras, and usually have less resolution. The advantage is that they are controlled by a computer. Most products show the viewer a preview of the image, and use focusing features in order to improve that image. A 1 to 3 mega pixel (MP) camera will produce a preview at the maximum resolution. As with a regular digital camera, the higher the mega pixels, the more details you'll be able to see. Cameras with higher than 3 mega pixels yield previews at a lower resolution than what the final image will be. Thus it's helpful to remember that many microscope cameras will snap a picture that will come out sharper than the image you see on the screen. Some regular hand held digital cameras also function as microscope cameras. 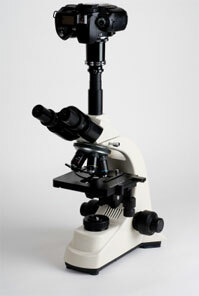 This type of camera is more versatile because it can be used independently of the microscope itself. The images are stored on internal memory cards and downloaded to a computer. This isn’t usually a problem, although it may be an issue if each image needs to be titled as it is captured. It can also be problematic if the images need to be measured or altered immediately. Of course most modern digital cameras don’t double as microscope cameras. Most don’t even have lens filter threads, which are needed to attach the microscope adapter. 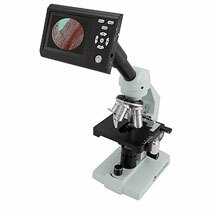 They also don’t offer a tilting LCD, which helps the camera function when mounted vertically on the microscope. If you're looking to buy a hand-held/microscope camera combo, always inspect each camera carefully in order to see if it can still function under your individual demands. A consumer that wishes to purchase ones of these really needs to do some homework. There are three areas that buyers need to consider when purchasing a digital microscope camera. The sensors, resolution, and software will make a big difference in the satisfaction with the unit. It is important to understand how each can affect the total outcome of the images you capture. The sensor is the heart and soul of any digital camera. They usually are classified as either a CCD or a CMOS. A sensor is an analog device that converts photons into electrical signals. This process is called the Analog to Digital Conversion and can happen in the sensor itself, the camera, or a computer. The larger the sensor, or the bigger the pixels are, the more sensitive it will be to light. So in theory a larger sensor should perform better. 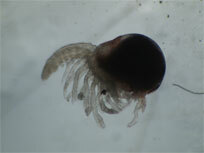 The larva on the right was shot with a 7.5 mega pixel camera attached to a stereo microscope. Decent detail, considering the original specimen was about 2mm! Resolution is the next thing to consider. The resolution is the total number of pixels that actually form the image. Resolution usually ranges anywhere from .3 MP up to 32 MP. A camera with a 1.3 MP resolution produces small files that work well for email. They are a considerable improvement over older resolution cameras. The difference in image quality is really not noticeable until you hit 5 MP, and the final leap in image quality doesn’t happen until the camera hits 20 MP. In most cases, cameras with this level of resolution exceed the resolution of the microscope’s optics. This can leave the user with “empty magnification”. This phenomenon can happen with any level of resolution, even low ones like 8 MP. Generally speaking, higher mega pixels are better. They can produce images that are more detailed and much more open to manipulation. This can also make accurate measurements easier to obtain. Yet one can still perform home or lab research with a less powerful camera, such as the 3 MP Celestron digital camera accessory below. The final topic that can make or break a purchase is the software and computer compatibility. A digital model should include software that drives the camera. This software usually shows a preview image relatively close to the resolution potential of the camera. The software also will have additional tools that let the user manipulate the image. These tools will often let the user control areas like focus, exposure time, and color balance. Most cameras will do this automatically, but a manual override lets the user have more flexibility. Some users find that software can be a compatibility problem. Some software works better with a PC than a MAC. Some software doesn’t work with new program versions either. A digital camera is a versatile tool that can make microscopy come alive. A consumer can buy a hand-held digital camera, or dish out a little extra cash for a dedicated microscope camera. Whichever path they choose to take, one should consider their needs in order to find the model that can capture the moment best.